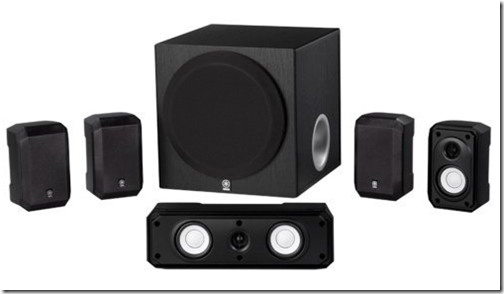 I have been looking for an affordable home theater system for my basement. This Yamaha 5.1-Channel Home Theater Speaker Package from Amazon is on sale for $99.00 with free shipping. It has 2-way satellite speakers with 2.5” woofer & 1/2” tweeter and a 2-way center speaker with dual 2.5” woofers & 1/2” tweeter. The speakers have magnetic shielding and a 8” 100W cube-type high power subwoofer. When even sub-par speaker systems are selling for over $100, getting a brand like Yamaha for $99 is a no brainer. This comment from Amazon reflects this exactly “Million dollar sound for pennies”.